Food testing: how is it done? Food testing in the UK is a complicated business with responsibilities shared between local, national and European authorities. While the Food Standards Agency (FSA) doesn't control the policy, the agency is in charge of day to day testing of food in the shops. This is carried out on their behalf by local government inspectors who visit premises and take samples. Trading standards officer check that the contents of food products match what's listed on the packaging. The FSA oversees this by testing more than 100,000 food products a year at the retail stage to check food is being labelled correctly. The government has now asked all food retailers to report by tomorrow on the presence of horse in their beef products. Companies will try and do this by getting their products tested at independent laboratories. Those labs will carry out two different types of tests - A DNA test and a test for protein called an ELISA test. This latter method can be done on the factory floor and can be likened to a pregnancy test that changes colour in the presence of the protein it is seeking. These tests are able to detect contamination amounts above 1-2%. DNA tests are more accurate, they can go down to 0.1%, but they cost more and each one can only be used to look for a specific animal, say horse or pork. One question that's often raised is about cooked meat products - is it possible to test these? Well yes, the DNA detection system called polymerase chain reaction (PCR) is very accurate, says Dr Chris Smart from Leatherhead Food Research. "It is a little bit more difficult with cooked products as you do get a certain amount of denaturing, but actually PCR is pretty sensitive and it would be able to detect DNA present in cooked product," he said. There are also questions about the levels of "alien" DNA that these tests can detect. Dr Mark Woolfe is the former head of contamination at the FSA. "DNA is very good for detecting the presence of a certain species but it is a lot more difficult to do it quantitatively - I would be rather wary of some of the results which give exact figures for the amount there," he said. 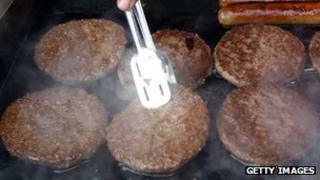 In addition to all retailers having to report on their products, the Food Standards Agency has also asked 28 local authorities to collect 224 samples from a range of outlets - they will try and quickly established if there is any horse or pork in processed beef products. Those result will be known early in April.